Sooner or later, the typical brass plugs can lead to leaks – this results in machine downtimes and increased maintenance intervals. It is often assumed that the problem is the sealant used, but this is usually not the reason: Due to different coefficients of expansion of brass plugs and steel plates, setting occurs during heating and cooling of the mould which consequently leads to leakage. 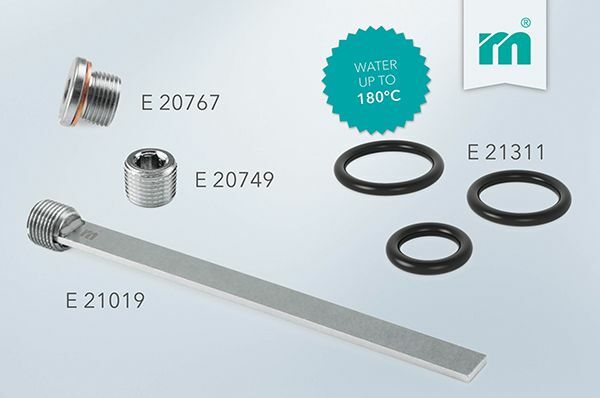 For this reason, Meusburger has added screw plugs made of steel and stainless steel to its range (E 20767 and E 20749), to guarantee safe sealing even at high temperatures. In addition, baffles are now available in stainless steel as E 21019. Leakage problems can also occur during temperature regulation with hot water and the use of conventional FKM/Viton® O-ring seals. Standard FKM/Viton® O-ring seals are only suitable to a limited extent over 100°C and the service life lessens significantly with the increasing temperature. The O-ring seals then become hard and leaky. For hot water applications, Meusburger now offers E 21311 High temperature O-ring seals in FKM plus material. These can be used for water temperatures up to 180°C and are immediately available from stock.